Venture capital funding is no game of chance. Quite the contrary in fact, it requires a great amount of dedication, research, knowledge and gumption. But one small fact that can too easily be overlooked – and possibly one of the most significant components when seeking venture capital – is the importance of starting the process off on the right foot. From valuation to your first seed round and beyond, how you begin your VC funding process can set the stage for your entire entrepreneurial journey. In order to get ahead and stay ahead, startups and entrepreneurs need to keep their eye on the prize from the very beginning. As such, it’s important to keep a few things top of mind when you first start your quest for funding. As a founder or entrepreneur, it’s crucial to have an intimate understanding of why you’re seeking funding. All too often, business owners bend over backwards in an attempt to raise money, simply because they’ve been told to do so, but without having a real reason to back the decision. VC funding is a powerful tool that can propel an organization or idea off the ground, but it isn’t appropriate for everyone. Having this internal conversation before pursuing funding will not only lend to greater focus throughout the process, but will also help achieve greater success since VCs are more apt to fund businessmen and women with a purpose. When it comes to funding, especially seed funding, it’s absolutely critical to get valued properly from the very start. Moving forward, companies are always valued in accordance to their first valuation, and the higher you start, the higher you finish. On the opposite end of that spectrum, if you are valued too low initially, your business endeavors could struggle from there on out. Enter your first valuation with a number in mind and don’t be afraid to fight for that number. Many founders find that their biggest business regrets stem from their very first valuation and their lack of fight. Don’t fall into this bucket – you are the one person who truly knows what your product or service is worth, and you shouldn’t be timid about getting what you deserve. Utilizing the knowledge and advice of a mentor or coach is key to successfully securing funding. It’s always helpful to have someone to approach with questions or for guidance, especially someone who has you and your business’ best interest at heart. Rely on an expert who has gotten their hands dirty fighting in the trenches, so to speak: advisers who have been where you’ve been and have the wisdom and experience to provide truly beneficial guidance. Failing isn’t going to be your biggest problem. How you react to that failure is what can make or break you as an entrepreneur. 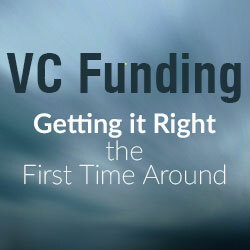 When it comes to securing VC funding, chances are you’re going to fall down a few times before things go your way. Don’t give up. Most importantly, don’t ever lose sight of the fact that this is your company. Even if people invest in it, it was your blood, sweat and tears that made it achievable. If possible, never give up the majority of your company. By retaining ownership of your company, you will always have a hand in its future and its success, no matter where the funding is coming from or what road your company is headed down.